But first…I shall recount my day. It is Saturday. At 9:30 AM my 17-year-old son comes into my room, sits next to me on the bed where I am still sleeping, and–while cuddling the cat–informs me that he has been up since 7:30 AM, has showered and washed his hair, and is ready to “do something.” Dressed in the new long sleeve American Eagle shirt that I got him (at 40% off on the back to school say, mind you), he is looking sharp. And awake. So, I head down stairs to make a cup of coffee and find that he has already unpacked my Starbucks VIA (I gave up on coffee makers long ago) and put the little packets in the stainless steel creamer pitcher from my grandmother, just like I do. Clearly, he has already had his cup. While sipping on my coffee, I make a few calls to family member on the other coast and catch my mother first. “It is a beautiful day and Drew and I are going to go do something,” I tell her. “Isn’t it a blessing to be able to say that and with confidence?” she asks. It is, I agree. A beautiful day. Feeling better. Mother and son time. Soon after, we head downtown to the Farmer’s Market where we have an early Ethiopian lunch. The most tender chicken, golden potatoes, and red sauce with nutmeg and cardamom to soak up in the spongy flatbread or injera. 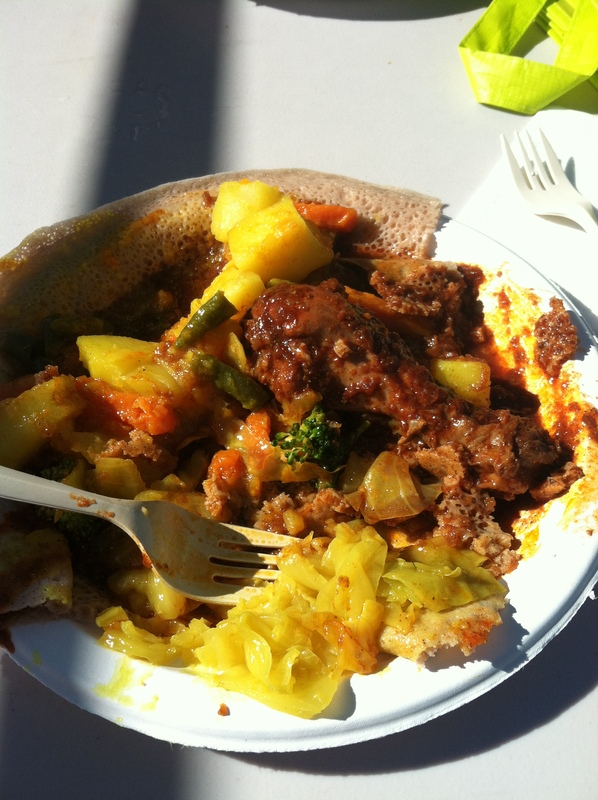 A delicious Ethiopian lunch at the Bellingham Farmer’s Market. Tummies full, we stroll through the market, stopping to smell Red Barn’s heavenly lavender soap slices (made by a now retired math teacher) and admiring the heirloom tomatoes at Tiny’s Organic. It is a beautiful, warm early fall day and so we head on to our next destination: Stimpson’s Nature Reserve. Once onto the trail, we pass the beaver pond and hike up a steady incline for a three-mile loop that will take us deep into the forests so typical of the Pacific Northwest. Tall cedars and hemlocks line a trail that has become dusty after a dry summer…okay, that parts not so typical. 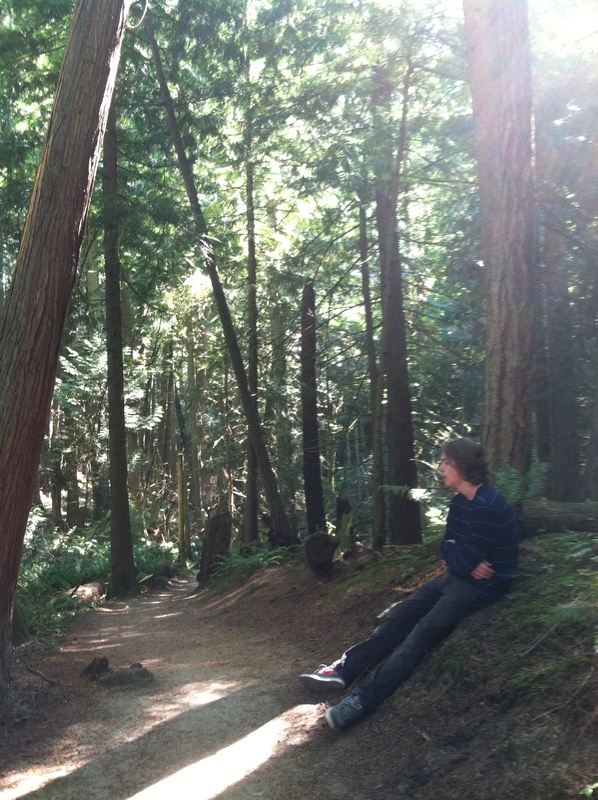 Sunlight streams through the dense forest. Waiting for Mom to catch up. Next on our agenda? My famous Cowboy Cookies, per his request. (Bonus recipe below, although no lemon is involved). 🙂 Once home, he settles onto his computer, I find a move on HBO (Sommersby) and the baking begins. A couple of hours and garage cleaning spree later, it is nearing time for dinner. We contemplate going to the store for some salmon, but he suggests we just “make something we have here.” Smart boy. I check the freezer. “Mini-tacos, tilapia with Cajun seasoning, or chicken?” I offer. “Chicken,” he replies. Very smart boy. I take two skinless/boneless chicken breasts out to thaw and know just what I will make–after we return from walking the dogs, that is. Two tired and happy dogs later, I wash my hands in warm, sudsy water and am ready to get cookin’. I scrub and quarter the Yukon Gold Potatoes and rinse and slice the narrow leafed Lacinato Kale from my bi-weekly Acme Farms and Kitchen local and organic Produce Box. Both go into pots of boiling salted water. “It’s going to get loud,” I warn before pounding and tenderizing the chicken breasts till they double in size. I set half a stick of butter in a large skillet to melt while juicing a Meyer lemon. Some of the juice gets poured over the pulverized side of the chicken so that it soaks into the nooks and crannies and the rest gets added the butter in the skillet. After flouring the chicken breasts on both sides, I place them in the pan to brown. I sprinkle a little garlic salt on one side and when ready to turn, a little kosher salt on the other. When the chicken breasts are nearly done, I add a few fresh rosemary leaves from my herb garden to the chicken breasts. Meanwhile, more butter, kosher salt, and rosemary leaves are added to the potatoes. The kale is plated with a dab of butter and a squeeze of lemon juice. “But what’s that flavor?” he asks. “No, that flavor on the chicken?” he probes, indicating that something more must be making the chicken so tasty. I take another bite and can taste what he means. “Fresh squeezed lemon juice,” I tell him. “It’s amazing how well pure lemon juice goes with chicken,” I say and he nods in agreement. I promise to show him how to make it next time. So easy. So good. “There is more of everything,” I tell him. “I think I’ll just have a little dessert now,” he says. That means Mom’s homemade Cowboy Cookies and Grandma’s Cake Batter Ice Cream. What else is a growing boy to do? Preheat oven to 325 degrees. Cream brown sugar, sugar, and butter. Add eggs one at a time. Add vanilla and beat till well-blended. Add flour one cup at a time with soda and salt. Stir in oatmeal, rice crispies, coconut, and chocolate chips. Drop by 1 1/2″ cookie scoops onto baking stone or greased cookie sheet. Bake 12-15 minutes. When you smell ’em they’re done! Makes three dozen yummy cookies. 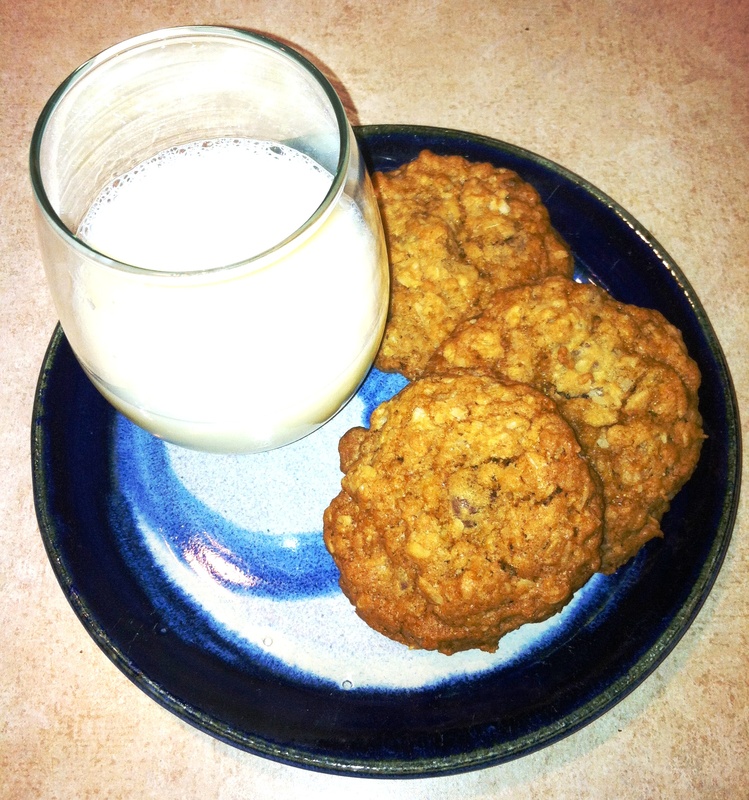 Chewy cowboy Cookies. Chocolate, coconut, rice crispies and oats.